For those flying into Rhode Island, Warwick&apos;s Green International Airport (PVD) is only 10 minutes from downtown Providence, and is conveniently located right off of Interstate 95. A favorite of business and leisure travelers, Green was named one of the top 10 airports in the U.S. in the Condé Nast Traveler 2017 Readers’ Choice Awards. Green offers an average of 120 nonstop daily flights via major carriers, with convenient connecting options to the rest of the world. Visit pvdairport.com for flight, airline and car rental information. Taxi service to and from Green into Providence cost approximately $35.00, plus gratuity. Uber – Please note, Green airport promotes Lyft as the only ride share service available. Uber does in fact pick up on the grounds as well. 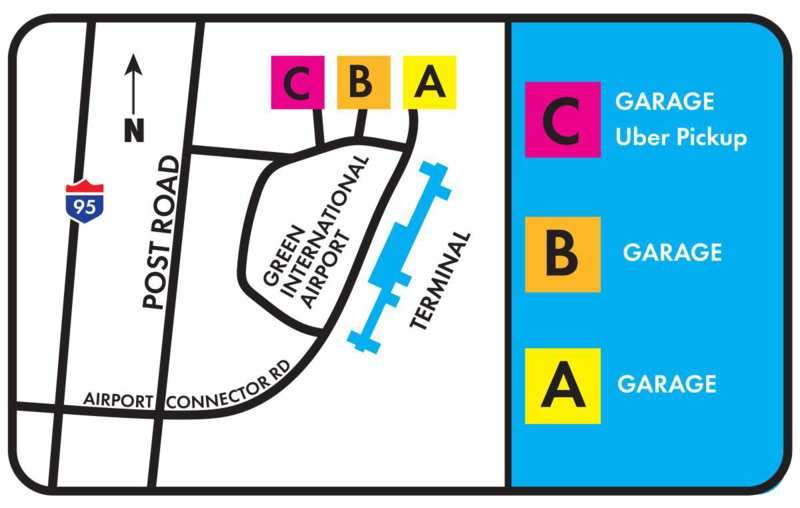 The designated pick-up area for Uber is within Garage C, just a short walk from the Arrivals/Baggage Claim area of the terminal. Lyft – The designated pick-up area for Lyft is located on the outer arrival’s roadway along the purple colored curb which is located directly outside the Arrivals/Baggage Claim area of the terminal. Please note the Green airport promotes Lyft as the only ride share service available however Uber picks up at Garage C.
Green Airport is conveniently connected to the MBTA commuter trains through the InterLink train station. Travelers can access the InterLink directly from the airport terminal through the skywalk. To get to the skywalk, proceed down the elevators to the ground level and walk to the far front left of the terminal, past the Visitor Information table, and look for signs directing to the InterLink connector. Train fares and schedules can be found on the MBTA website at mbta.com.